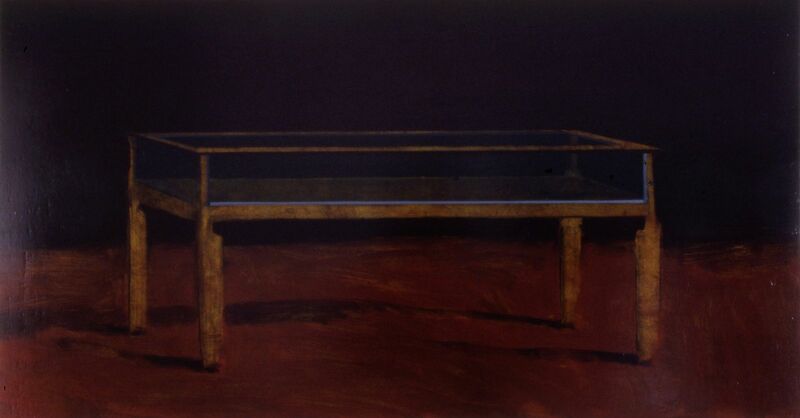 The series is closely connected to his personal life experience, one – the landscape series – grew out of his life on the family farm and the other is the furniture series, to which Table belongs. In a statement about this body of work the artist said “these started with empty bookcases, representing a search for knowledge and the anticipation of achieving it. Keeping the bookcase empty acknowledges that any achievement is ephemeral and leads to further desire. The later paintings in the series (a chair, table, cabinet etc) work with the ideas of anticipation of arrival and departure which were alluded to in the bookcase paintings.